Someone asked me to post pictures of Palawan. 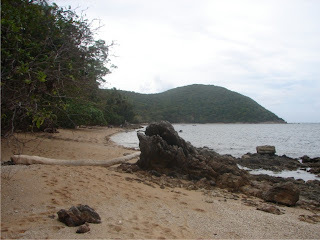 I have not gone to Palawan proper but I have visited the farthest island in the Calamianes group, Popototan. 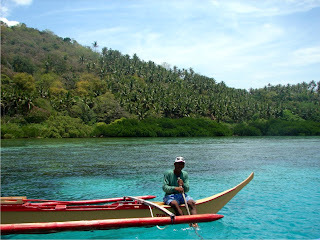 So I 'll post images of it and the adjacent Busuanga islands. When looking at pictures of the island landscapes it is also inevitable to tackle the native vegetation, mostly dwarfed coastal species. 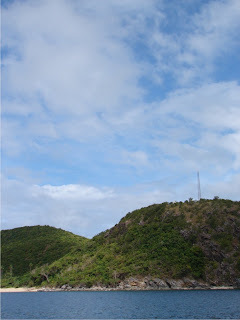 Popototan island is located at the most western part of Busuanga. 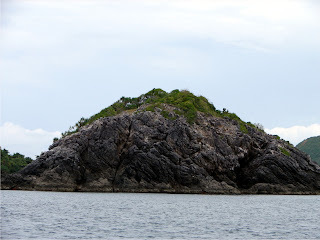 We took the Super ferry to Coron town and rode a 4 hour banca ride to the island, passing through the clean waters of other numerous small islands. Each are covered almost fully with greens interrupted with limestone cliffs and sandy beaches. The islands looked almost deserted, only a few had shanty houses but there are a handful of resort developments. 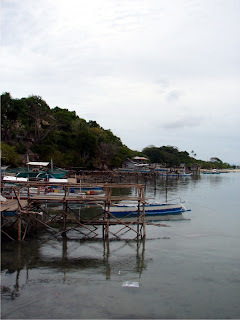 P opototan, one of the larger islands, had a barangay settlement and a major resort development. The northwest tip is uninhabited. The pristine white sand beaches are however open to the turmoils of the South China Sea. 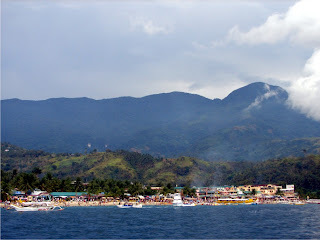 this is home to a number of species like molave, pandan dagat, kalumpang, dapdap, bani, dangkalan etc. On the uninhabited beach also grows bantigue (or Pemphis acidula) a favorite of bonsai collectors. 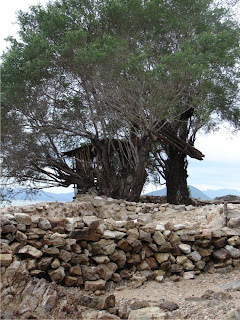 Bantigue was already ransacked to almost extinction in the islands off Luzon. But they say that the Luzon bantigues are coveted because they are typhoon scarred, which is attractive to bonsai hunters. The bantigues here are almost straight. I hope they stay that way to assure their existence. 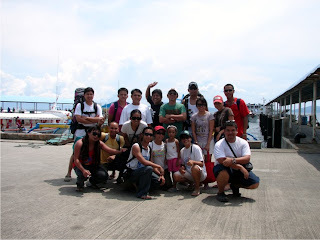 We had our company's team building trip to Puerto Galera in Mindoro. I usually join trips not only because of the anticipated fun (but of course who could say no to co-worker bonding and a free trip :) ) but also the chance to see new places. I have not been to Mindoro before (almost had the chance before with a trip to Sablayan with some DENR people but begged off the last minute) so to see what is off the Batangas coast is very much welcome. Plus I would have the opportunity to learn what kind of flora there is in the tamaraw's last frontier. Our base camp was at the very crowded but festive White Beach. My immediate impression was Boracay knock-off. It has white sand but not as fine as the polvoron like grain of Station 1 in Bora. But then again if you see the crystal blue waters against the clear blue sky you kinda think that matter is forgiveable. 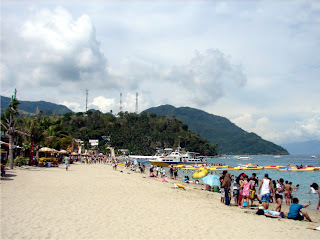 Add the fact that it is nearer Manila and a lot less costly than to go to the real mc-coy. But after a supposedly quick breakfast (which became long because of the very long lines to get seated and the almost 30 minute wait for a tapsilog) and freshening up in the rooms we rented, our company set off on our real adventure destination. 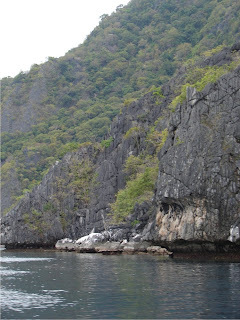 We were whisked away by a rented boat a few coves away to a semi hidden spot. Upon reaching it, the boatmen set anchor and one by one my companions alighted the bancas donning orange lifevests and snorkling gear. I did not immediately join in the action as I first panned my eyes on the peripheral vegetation. 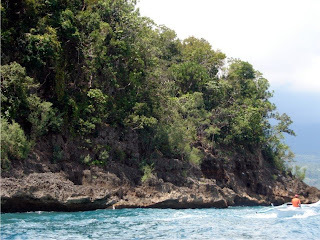 The snorkling spot was an enclave surrounded by limestone cliffs and small beach interruptions. But the limestone surface was not at all that visible because majority of it is still covered with vegetation. 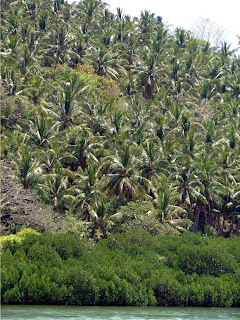 My initial ocular was a bit hazy because of our distance from the cliffs but I could recognize the familiar coconut (Cocos nucifera) intersparsed with another provincial palm staple, the buri or buli' (Corypha utans). 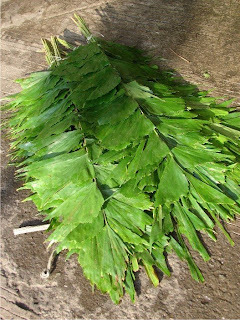 Both palms have economical use in most Philippine societies. 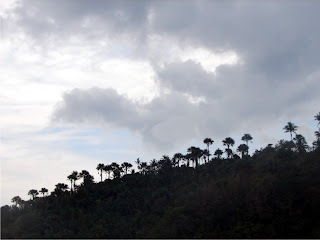 These palms' silhouette shape the majority of the Puerto Galera horizon. Seeing how much my officemates enjoyed the snorkling, I went in after them and took a few minutes to swim with schools of coralfishes. 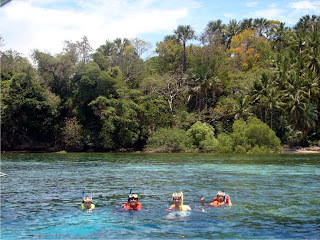 This is the second time for me to go on snorkling. 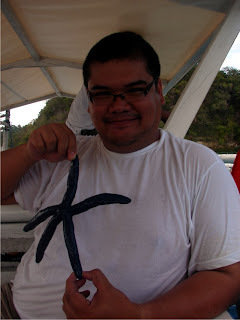 The first one was in Batangas but we were practically near the safety of the shore. This time around we were about a hundred meters away from the beach and relied on our life vests for safety. Though I know how to swim, it is quite tiring for me to keep afloat coupled with the breathing through a mouthpiece. But the whole predicament was well worth the view you could see underwater. Makes you want to try the next step which is scuba diving - but not in this trip. After more than an hour of floating and poking our heads into the water, we all got tired and decided to head for the beach to enjoy a little land fun. While all were basking under the sun and on the white sand, my friend Irene accompanied me exploring the nooks and crannies of the cove we were in. 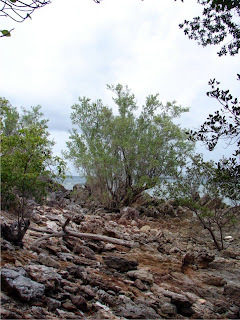 We first scrutinized the vegetation growing out of the limestone cliffs. There was a mixture of trees and shrubberies jutting out from the crevices. 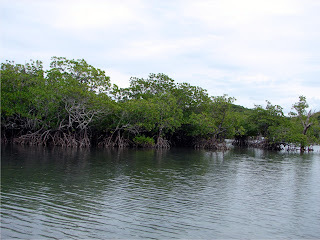 There were a lot of mangrove and beach species present. Some I could not identify at all. 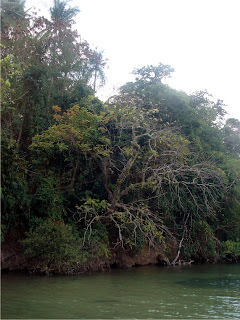 There were familiar ones like kalumpang (Sterculia foetida), Dracaena multiflora, pandan-dagat (Pandanus tectorius), talisay (Terminalia catappa) and bantigue (Pemphis acidula). 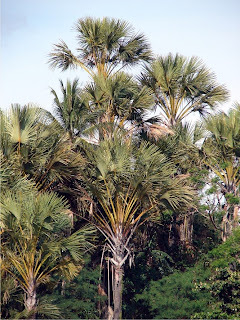 I opted to study the buri palms upclose so I ventured a little inland, but I never reached where the buris were. I got distracted with a few plant finds along the way. 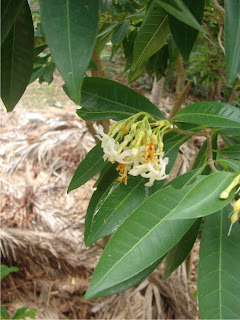 I saw a couple of plant species that are members of the Apocynaceae family which includes the familiar kalachuchi (not native but is actually abundant in Puerto Galera). 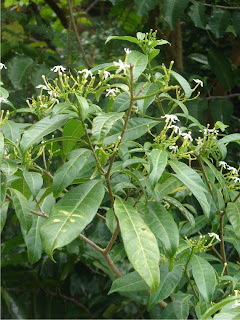 The first was a variety of pandakaki (Tabernaemontana sp.). I took pics and a couple of seedpods, which made me regret it. 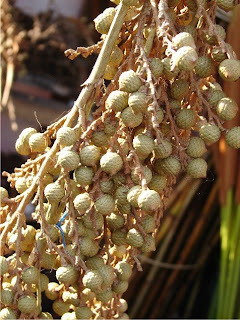 My friend Ronald Achacoso once told me that pandakaki seedpods have some sort of irritant. I now personally experienced what this results into, with my hands and feet feeling like they were continuously bitten by red ants - made me to race back to the beach and dive back into the water. The pandakaki shrub has nice white flowers which would have probably made it a nice garden specimen, sans the potential pain it inflicts. The second Apocynaceae species I found was what they call bayag-usa or Voacanga sp., probably globosa. 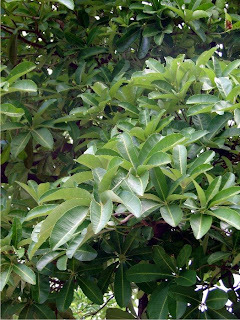 This is a small tree with wide ovate leaves and white clusters of pinwheel flowers. 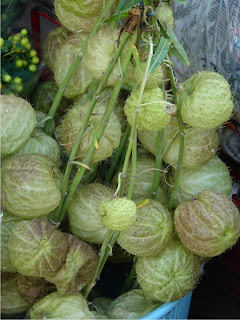 They bear fruits bunched in twos, resembling testicles, reason why the plant is called bayag-usa or deer testicles. This tree is an attractive specimen plant when in flower and ultimately in fruit. 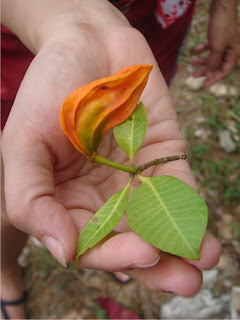 But the fruits are not edible but rather toxic, laced with the white resinous sap common with most Apocynaceae members. There were other plant finds in this trip but I would write about them in a future blog. Eventually our stomachs caught up with us, signifying that we had to head back to White Beach and prepare a late lunch. 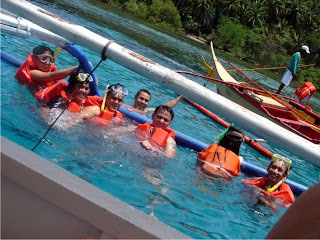 we again rode our rented banca and set sail into the clear blue waters of Mindoro. The sky had an overcast of clouds, making it ideal to sit near the bow of the banca. I tried to get a last glimpse of the cliff profile, spotting if I missed something from our earlier trip. But the limited light made it only harder to spot plants even if I squinted my eyes almost to shut. Had to content myself with the anticipation of that late lunch and maybe an early shut-eye. Besides, the day and the plant find list was already very long. I accompanied our HR Manager to buy fresh flowers for a company event. 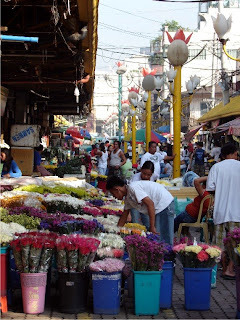 We decided to go to the well known Dangwa in Sampaloc, Manila early in the morning to catch the new daily deliveries. We were looking for white flowers for a simple and non-striking floral display and Dangwa was the right and obvious source choice. 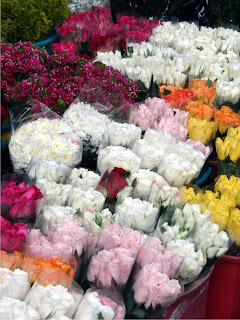 You probably could not get that much variety of blooms and materials even if you go straight to the flower plantations in Benguet and the Mountain Province, (not that we were willing to go all the way there, we only needed a few items). I was expecting to see a lot of flowers and plant items so I came armed with my idiot proof camera. A shutterbug could not run out of subjects in this place, but I tried to zoom-in into particular stuff you could find in our Philippine forests. I just wanted to see if locals have learned to harness the beautiful and natural plant products in the countryside. True enough there are interesting native flora items in the merchandise sold. 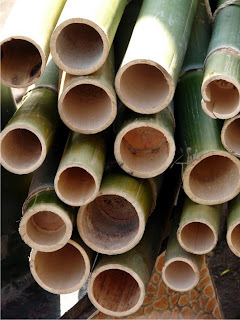 Buho bamboos are sold for use as framing and stands for flower arrangements. 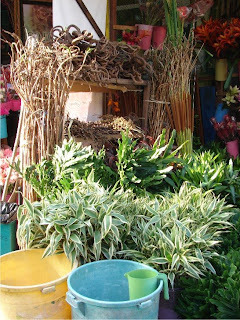 The distinct leaves of the Fishtail palm or pugahan are used as green background for bigger floral displays. 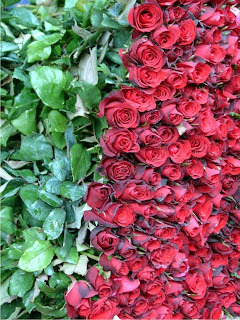 The seed sprays are also offered for fillers for floral and fruit arrangements. 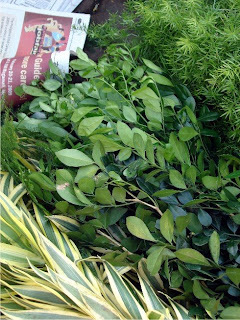 Rather than the short-lived sweet flowers of kamuning, its fine foliage is used, probably also as leaf fillers for smaller arrangements. 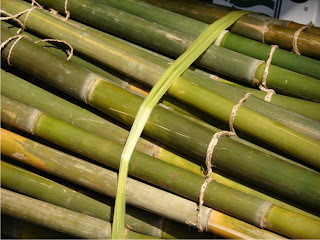 The fruits of some palms like rattan are interestingly shaped to use as berry substitutes. 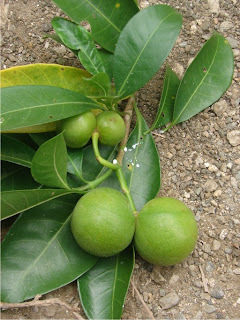 The first trees I knew to be native are banaba, supa and dita. When I started to take pics of native trees did not have problems recognizing the 3 trees in UP campus. But the dita trees in UP are not that impressive to photograph. I asked fellow plant enthusiast Ronald Achacoso where I could see full grown dita trees and he quickly pointed out the UST Campus. 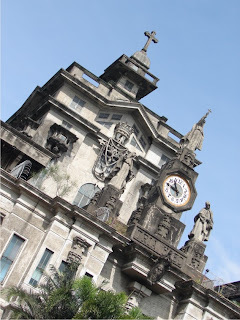 I am no stranger to the University of Santo Tomas as 3 of my sisters are UST grads - I actually considered enrolling in the pontifical univesity for my B.S. in Architecture but in the last minute decided that my parents should at least have 1 offspring as U.P. grad. But I could remember wandering around the tree laden grounds when I was still a kid accompanying my sisters in school events. I am trying to paint a mental picture where the dita trees would be but could zoom into my hazy recollection. Ronald said they are all over the campus. I was thinking it might be just a few trees dispersed along with some familiar species like acacia or narra. had to make that trip back to the UST Campus in España and see again for myself where the dita trees could be found. I was expecting that I would a hard time locating them. Turned out they are not that hard to find because they are literally everywhere as Ronald claimed. Dita is Alstonia scholaris. 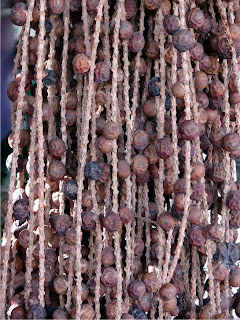 The common name is devil tree yet I have yet to confirm why it is called such - but maybe attributed to the fact that a lot of its parts are poisonous especially its white resinous sap. In UST, the tree is labeled as scholar's tree, probably because of its scientific name. 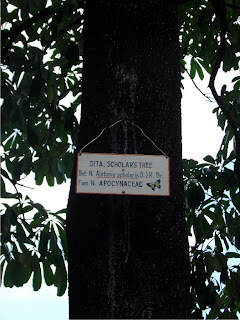 Margaret Barwick wrote in her Tropical and Subtropical Trees Encyclopedia that dita was botanically named because dita wood is used in the making of blackboards in India, hence scholaris. The dita is common here in the Philippines. I saw specimens growing in the foothills of Zambales as well as in Quezon, Palawan and Panay. 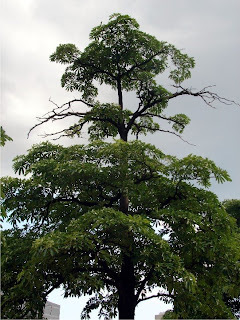 The bark is said to be used as herbal, remedy for malaria. The wood is soft and easy to cut and shape. The dita tree structure is actually ideal for landscape as it is erect and grows layered. 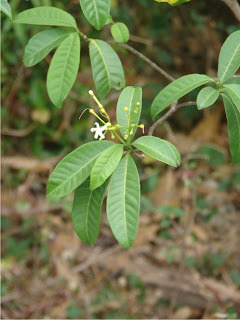 The leaves are glossy and grow in a whorl. It also bears occasional small white flower clusters. The UST ditas are already mature. I am not sure when they were planted in the España campus but I am guessing it was at least 3 decades old. U.S.T actually boasts of a good botanical collection courtesy of their botanical department so it is not actually a surprise to find the good native tree used in their campus planning. 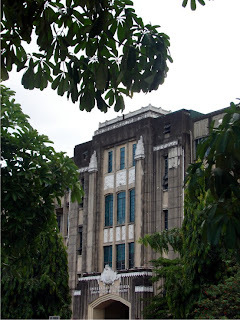 If you are eager to find where the ditas could be found in the grounds, they are easy to spot lining the roads leading to the Main Building coming from Governor Forbes and P. Noval streets. Also the sidewalk and road island on Gov. Forbes are lined with this stately tree. I usually spend Holy Thursday with my parents and my siblings' families. We follow a Visita Iglesia route of 7 churches (traditionally it should be 14, a church for each station of the cross), but ever since I could remember, my dad would only map out a route for 7 churches, so we could spend reciting prayers for 2 stations in each church. This year our itinerary included 5 churches we usually go to , Lourdes, Sto Domingo, Loreto, San Sebastian and UST. I heard somewhere that when you visit a church for the first time, you are entitled to make a wish, so I asked if we could include a few new ones in our route. My dad suggested we go to churches in Malabon and Navotas, where our paternal clan traces its roots. So after we retraced our steps to the churches of Quezon City and Sampaloc, we went a little of course north to San Bartolome and Navotas churches. I took pictures of our destination churches - other than trees, I am a sucker for taking pics of historical structures. After finishing our Visita Iglesia, I realized most of my pics of the old churches included a tree into the framing. The churches we went to were decades old, if not centuries. Most of the entourage trees were also age old, suggesting they were planted a long time ago, some maybe even at the time the church was built. 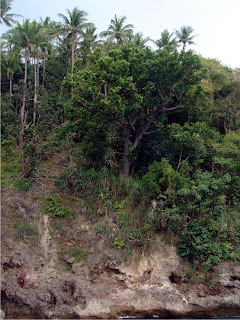 The old trees were mostly native, probably from time before a lot of foreign species were introduced into Metro Manila. That is why most old parts of Manila have ancient trees that would date as far back to the American era and even the Spanish colonial period. A lot of these trees deserve the same reverence that the old churches get.